Most Likely Drinking Game was submitted by the God of Games. An excellent game to play with people you don’t know or you’ve just met… Excellent for travellers! You’ll need to get pretty creative with your questions and don’t be shy when the questions eventually turn sexual… Never played a game where that hasn’t happened! If you’re someone who seems pretty adventurous/clumsy/crazy/fun then you might end up drinking a lot in this game. I hope you have lots of alcohol ready just in case. On the count of 3, everyone points to whoever they think would be most likely to do whatever was mentioned. You have to take 1 drink for every person who’s pointing at you. So if 5 people think you’re most likely to get in trouble with the police for flashing then you take 5 drinks. 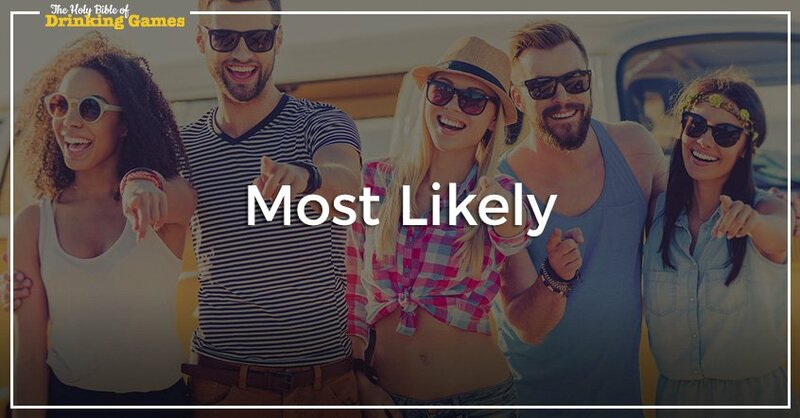 A great game to play with people you’ve just met to break the ice and don’t be surprised if the “most likely” questions get sexual… Always happens. Everyone sits around in a circle. On the count of 3 everyone points at someone who they think is most likely to do whatever was mentioned. For every person who’s pointing at you, you take 1 drink. So if 7 people think you’re most likely to break your toe you take 7 drinks.